Afonso V, called the African, was King of Portugal and the Algarves. His sobriquet refers to his conquests in Northern Africa. As of 1471, Afonso V was the first king of Portugal to claim dominion over a plural “Kingdom of the Algarves,” instead of the singular “Kingdom of the Algarve.” Territories added to the Portuguese crown lands in North Africa during the 15th century came to be referred to as possessions of the Kingdom of the Algarve (now a region of southern Portugal), not the Kingdom of Portugal, the “Algarves” being the southern Portuguese territories on both sides of the Strait of Gibraltar. The fifth son of King John I and his wife Filipa de Lencastre (sister of King Henry IV of England) Prince Henry was born in 1394 and died in 1460. 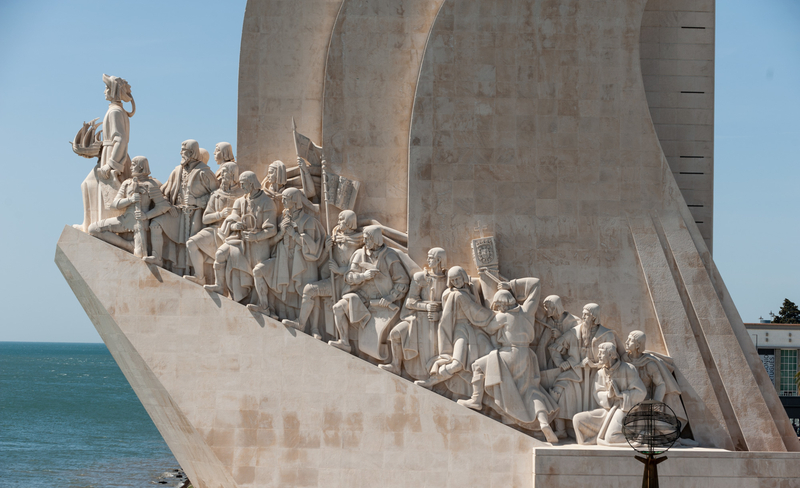 He was a central figure in the early days of the Portuguese Empire and the 15th-century European maritime discoveries and maritime expansion. Through his administrative direction, he is regarded as the primary initiator of what would be known as the Age of Discovery, which began with the conquest of Ceuta (1415), the Muslim port on the North African coast across the Straits of Gibraltar from the Iberian Peninsula. Vasco da Gama was a Portuguese explorer and the first European to reach India by sea. His initial voyage to India (1497–1499) was the first to link Europe and Asia by an ocean route, connecting the Atlantic and the Indian oceans and therefore, the West and the Orient, after decades of attempts, with thousands of lives and dozens of vessels lost in shipwrecks and attacks. Da Gama led two of the Portuguese India Armadas, the first and the fourth. The latter was the largest and departed for India four years after his return from the first one. For his contributions, in 1524 da Gama was appointed Governor of India, with the title of Viceroy, and was ennobled as Count of Vidigueira in 1519. Afonso Gonçalves Baldaia was a 15th-century Portuguese nautical explorer. He explored much of the coast of Western Sahara in 1435–1436 on behalf of the Portuguese prince Henry the Navigator. He would later become one of the first settlers of Terceira Island in the Azores. Pedro Álvares Cabral was a Portuguese nobleman, military commander, navigator and explorer regarded as the European discoverer of Brazil. In 1500 Cabral conducted the first substantial exploration of the northeast coast of South America and claimed it for Portugal. While details of Cabral’s early life remain unclear, it is known that he came from a minor noble family and received a good education. He was appointed to head an expedition to India in 1500, following Vasco da Gama’s newly-opened route around Africa. Born into a family of the Portuguese nobility in around 1480, Magellan became a skilled sailor and naval officer. In 1517, following a disagreement with the Portuguese King, Manuel I, he moved to Spain, presenting his services to King Charles I of Spain to search for a westward route to the Maluku Islands (the “Spice Islands”). Despite a series of storms and mutinies, the expedition reached the Spice Islands in 1521 and returned home via the Indian Ocean to complete the first circuit of the globe. Magellan did not complete the entire voyage, as he was killed during the Battle of Mactan in the Philippines in 1521. Nicolau Coelho was an expert Portuguese navigator and explorer during the age of discovery. He participated in the discovery of the route to India by Vasco da Gama where he commanded Berrio, the first caravel to return; was captain of a ship in the fleet headed by Pedro Álvares Cabral who landed in Brazil. He died at sea, possibly off the coast of Mozambique, while returning from India in the 5th Portuguese Armada with Francisco de Albuquerque. Gaspar Corte-Real was a Portuguese explorer who alongside his father João Vaz Corte-Real and brother Miguel, participated in various exploratory voyages sponsored by the Portuguese Crown. These voyages are said to have been some of the first to reach Newfoundland and possibly other parts of northeastern Canada. Threatened by the presence of French ships along the coast of Brazil, the Portuguese crown in December 1530 sent a fleet with 400 people led by Martim Afonso de Sousa to establish control and explore. Sousa was the first Royal Governor of Brazil. He settled in the north-east region of the modern country and from 1542 to 1545 he was governor of Portuguese India. João de Barros, called the Portuguese Livy, is one of the first great Portuguese historians, most famous for his Décadas da Ásia, a history of the Portuguese in India, Asia, and southeast Africa. Estêvão da Gama was the Portuguese governor of Portuguese Gold Coast and Portuguese India, named after his paternal grandfather Estêvão da Gama, Estêvão was the second son of Vasco da Gama and brother of Cristóvão da Gama. He commanded the fleet that entered the Red Sea, with the intent of attacking the Ottoman fleet in its harbour at Suez. Reaching Suez, he discovered that the Ottomans had long had intelligence of his raid, and foiled his attempt to burn their beached ships. Diogo Cão was a Portuguese explorer and one of the most notable navigators of the Age of Discovery. He made two voyages sailing along the west coast of Africa in the 1480s, exploring the Congo River and the shores of present-day Angola and Namibia. António de Abreu was a 16th-century Portuguese navigator and naval officer. He participated under the command of Afonso de Albuquerque in the conquest of Ormus in 1507 and Malacca in 1511, where he got injured. Departing from Malacca in November 1511 with four ships, in an exploratory voyage to the ‘Spice Islands’ of Maluku, he led the first European expedition to reach Timor and the Banda Islands, in Indonesia, in 1512. Afonso de Albuquerque, also called Afonso de Albuquerque, the Great, was a Portuguese soldier, conqueror of Goa (1510) in India and Melaka (1511) on the Malay Peninsula. His program to gain control of all the main maritime trade routes of the East and to build permanent fortresses with settled populations laid the foundations of Portuguese hegemony in the Orient. Co-founder of the Society of Jesus, he was born in Javier, Kingdom of Navarre (in present-day Spain) and he was a companion of Saint Ignatius of Loyola and one of the first seven Jesuits who took vows of poverty and chastity at Montmartre, Paris, in 1534. He led an extensive mission into Asia, mainly in the Portuguese Empire of the time and was influential in evangelization work, most notably in India. He also was the first Christian missionary to venture into Japan, Borneo, the Maluku Islands, and other areas. He was about to extend his missionary preaching to China when he died on Shangchuan Island. Cristóvão da Gama was a Portuguese military commander who led a Portuguese army of 400 musketeers on a crusade in Ethiopia and Somalia against the far more massive Adal Muslim army of Imam Ahmad ibn Ibrahim al-Ghazi, aided by the Ottoman Empire. He was severely wounded in his last battle, after which he was captured and eventually executed. Nicolau Coelho holds the flag believed to be the one from the time of D. Afonso Henriques. Martim Afonso de Sousa holds the flag used between the reign of King John I and King Afonso V.
The padrão was a stone monument intended to signal the presence of the Portuguese and Portugal’s right to possession. It was a symbol not only of precedence and political domain but also of the consecration of the land to God and the Church. This padrão is carved with the royal coat of arms used from the reign of King John II until King Sebastian, topped by a cross and drawn on cords by António de Abreu, Diogo Cão and Bartolomeu Dias, the sailors (and navigators) who first placed these stone markers along the southwest and southeast coasts of Africa. Symbol of conquest and weapon signifying nobility. It is an attribute not only of the royal family (Peter, Duke of Coimbra, Ferdinand the Holy Prince and King Afonso V) but also of those who had the right to it due to their social standing or because they had distinguished themselves through their warlike exploits. At the back of the monument stands the sword of Avis, on a stylised cross. The sword and cross symbolised the growth of the empire and faith, which are here used to express the idea of the Crusades through sculpture. Ferdinand, the Holy Prince, was born on 29 September 1402 and died the 5 June 1443. Son of King John I, he was the youngest of the “Illustrious Generation” of 15th-century Portuguese princes of the House of Aviz and lay administrator of the Knightly Order of Aviz. In 1437, Ferdinand participated in the siege of Tangier led by his older brother, Henry the Navigator. In the aftermath, Ferdinand was taken as a hostage and used as a bargaining chip. When it became apparent that the Portuguese authorities had no intention of giving up Ceuta, Ferdinand was transferred to a prison in Fez, and he died in captivity. João Gonçalves Zarco (1390 – 1471) was a Portuguese explorer who established settlements and recognition of the Madeira Islands, together with Tristão Vaz Teixeira. He was appointed first captain of Funchal by Henry the Navigator. Born in Lagos, Algarve, the day of his birth is not precise. Little is known about his life, before being recognised as a shield-bearer for Prince Henry, the Navigator. After several missed attempts, he finally managed to round Cape Bojador, a moment that proved to be decisive for the future of Portugal maritime exploration. In 1435, Eanes made another voyage, with Afonso Gonçalves Baldaia. They sailed about 30 leagues (144 km), or even 50 leagues (240 km) south of Cape Bojador and reached the African coast, to a bay they called Angra dos Ruivos. Pêro de Alenquer was a 15th-century Portuguese explorer of the African coast. He accompanied Bartolomeu Dias on his journey around the Cape of Good Hope in 1487/1488 and he was his flagship pilot on the first voyage to India. Pedro Nunes (1502 – 1578) was a Portuguese mathematician, cosmographer, and professor. He is considered to be one of the greatest mathematicians of his time, best known for his contributions in the nautical sciences (navigation and cartography), which he approached, for the first time, in a mathematical way. He was the first to propose the idea of a loxodrome and was the inventor of several measuring devices, including the nonius (from which Vernier scale was derived), named after his Latin surname. Pêro Escobar was a 15th-century Portuguese navigator who discovered São Tomé (December 21, 1471), Annobon (January 1, 1472), Príncipe (January 17, 1472) islands, together with João de Santarém c. 1470. He was the pilot of the famous Bérrio caravel on Vasco da Gama’s first expedition in 1498 to sail directly from Europe to India. He was also on Pedro Álvares Cabral’s discovery of Brazil in 1500. In 1471, working in the service of Lisbon merchant Fernão Gomes, who had a concession for the exploration and trade in the Gulf of Guinea, Pedro Escobar helped to discover the gold industry that would grow around Elmina in 1471. A Majorcan cartographer of Jewish origin believed to have moved to Portugal in exchange of many boons and bounties. According to Duarte Pacheco Pereira, the author of ‘Esmeraldo de Situ Orbis’, Jacomo de Maiorca had a significant role in the Portuguese cartography, passing along his knowledge to younger generations. He was a native of Covilhã in Beira. In his early life, he had gone to Castile and entered the service of Don Juan de Guzmán, brother of Enrique de Guzmán, 2nd Duke of Medina Sidonia. Later, when war broke out between Castile and Portugal, he returned to his own country, and attached himself, first as a groom, then as a squire, to Afonso V of Portugal and his successor John II of Portugal. In 1487, his overland expedition made its way to India, exploring trade opportunities with the Indians and Arabs, and winding up finally in Ethiopia. 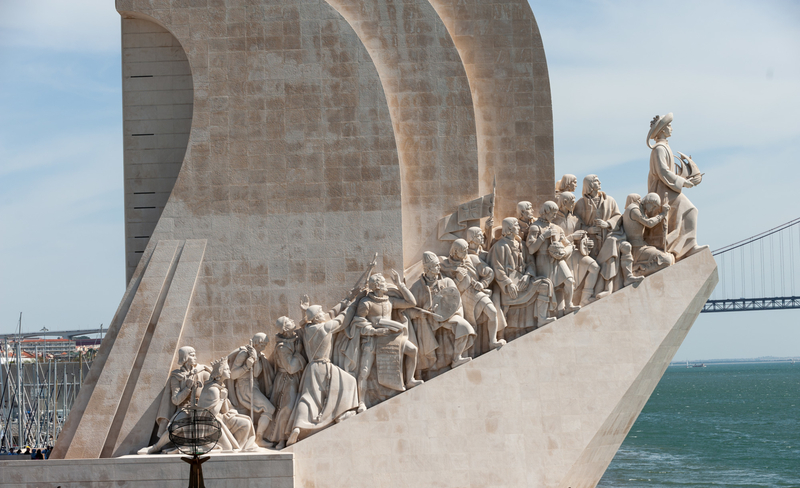 His detailed report was eagerly read in Lisbon, as Portugal became the world’s best-informed centre for global geography and trade routes. Gomes Eanes de Zurara adopted the career of letters in middle life. He probably entered the royal library as assistant to Fernão Lopes, during the reign of King Edward of Portugal (1433–1438), and he had sole charge of it in 1452. His Chronicle of the Siege and Capture of Ceuta dates from 1450, and three years later he completed the first draft of the Chronicle of the Discovery and Conquest of Guinea, which contains some account of the life work of that prince and has a biographical as a geographical interest. Zurara had little of the picturesque ingenuousness of Lopes and loved to display his erudition by quotations and philosophical reflections, showing that he wrote under the influence of the first Renaissance. Nuno Gonçalves was a 15th-century Portuguese court painter for King Afonso V of Portugal. He is credited for the painting of the Saint Vincent Panels. The panels depict the main elements of Portuguese society in the 15th century: clergy, nobility and everyday people. He is believed to have been a member of the Álvares Cabral’s crew on his journey to Brazil, where he assumedly celebrated the first mess. Little is known about Frei Gonçalo, other than he moved to Congo in 1610, by command of the Congolese king. He died there. Fernão Mendes Pinto was a Portuguese explorer and writer. His voyages are recorded in Peregrinação, his autobiographical memoir. The historical accuracy of the work is debatable due to the many events which seem far fetched or at least exaggerated, earning him the nickname “Fernão Mentes Minto” (wordplay with the Portuguese verb mentir ‘lie’, meaning “Fernão, are you lying? I am lying.”). Queen of Portugal from 1387 until 1415 by marriage to King John I, she was born into the royal family of England and her marriage secured the Treaty of Windsor. She is the mother of many of those who later became known as the “Illustrious Generation” in Portugal. She is the only female character in the monument. Infante D. Pedro, Duke of Coimbra, better known as Infante D. Pedro das Sete Partidas do Mundo (of the Seven Parts of the World) because of his travels. Possibly the best-travelled prince of his time, he was regent between 1439 and 1448. He was also 1st Lord of Montemor-o-Velho, Aveiro, Tentúgal, Cernache, Pereira, Condeixa and Lousã. Pêro Escobar bears the flag of the Order of Christ, a religious and military order that had spiritual jurisdiction over the discovered lands. A small, highly maneuverable sailing ship developed in the 15th-century to explore along the West African coast and into the Atlantic Ocean. The lateen sails gave it speed and the capacity for sailing windward. The Portuguese used caravels for the oceanic exploration voyages during the 15th and 16th centuries in the Age of Discovery.